My Gallipoli looks at the history of Gallipoli from the months immediately before the landing at Anzac Cove in April 1915 through to the Allied retreat and the aftermath of the first World War, and beyond to the present day pilgrimages and commemoration ceremonies at the site of ... read full description below. My Gallipoli looks at the history of Gallipoli from the months immediately before the landing at Anzac Cove in April 1915 through to the Allied retreat and the aftermath of the first World War, and beyond to the present day pilgrimages and commemoration ceremonies at the site of this historic campaign. Stories of courage, valour, despair and loss are told through the eyes of many different participants, including the young Turkish shepherd recruited to fight for his country and the British seaman who towed the first boats onto the shores of Anzac Cove in the dawn of 25 April, to the Ghurkas, Aghans and Sikhs who fought in the British Indian Army and the soldiers of the Auckland and the Wellington Battalions who took part in the decisive battle of Chunuk Bair. Direct accounts from real participants such as the Australian war correspondent C.E.W. Bean, Turkish commander Mustafa Kemal, Anzac war scout Harry Freame and sniper Billy Sing, mingle with factually based descriptions from a host of characters including the exhausted nurse aboard HMS Gascon on the night of 25 April, the devastated mother seeing her wounded son for the first time after the war, and the old Turkish man visiting his brother's grave at Gallipoli 70 years after his death. 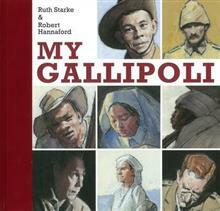 The rich panoply of voices in Ruth Starke's text offers upper primary and lower secondary students a broad understanding of the Anzac Campaign and the current views of those engaged in the war as well as those at home. Its wide sweep will provide many entry points for discussion and reflection. The strong, visceral artwork of renowned fine artist, Robert Hannaford captures the landscape of Gallipoli and the characters and mood of each account with the arresting intensity of a would-be war artist. Like Ruth's text his work will provide art students with a great deal to study and examine.